This week I received my package from the Vintage Sheet Swap. There are some lovely florals, some really faded and worn fabrics-in a good way, some I haven't seen before and many that I don't have in my stash. One of things I love is seeing some of the same prints I already have but in different colourways. 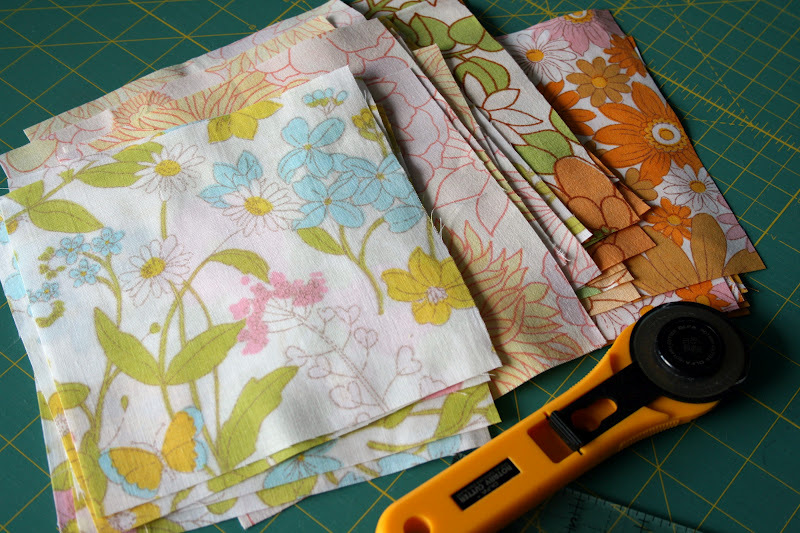 Having a new bundle of fabrics was all the motivation I needed to pull out the sewing machine. I cut up some 6 1/2 inch squares and I thought I really ought to try something else-seen as I have made four quilts of varing sized squares now. The thing is, although I admire fancy schmancy quilt designs enormously, I actually really like squares. Yep I am a simple girl! I kind of thought it was a bit wonky but once it's all pieced together, it seems to work out I think. I just stitched up a small portion to make sure I was on the right path...and I think I am. I am not sure what I am making yet. Maybe a quilt or maybe a European Pillow Case. 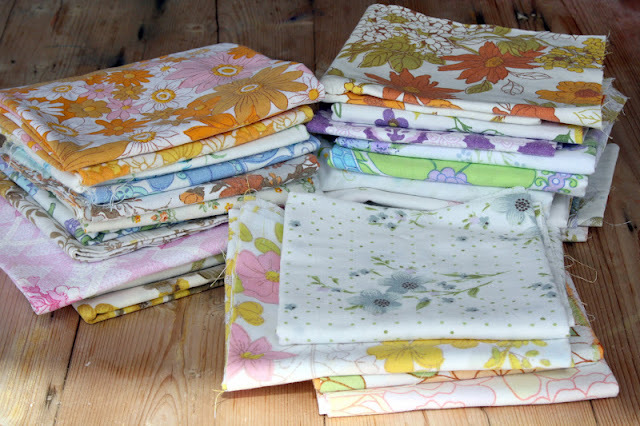 Did you participate in the Vintage Sheet swap as well? What will you be making? I'd love to see. For more creative spaces, pop over here. Whatever you end up with, it's going to be gorgeous Lea. There's something so special about vintage sheets isn't there. It looks lovely so far. Great idea to do a swap with vintage sheets - I have one or two myself in my stash waiting for some inspiration to hit! Lovely sheets and great triangles ~ I have been meaning to give triangles a go! What a haul - some great patterns in there! Now I wish I had gotten my bum into gear and participated! Ah well, there's always next time! Wow Lea your triangles look fantastic! Beautiful fabrics too! 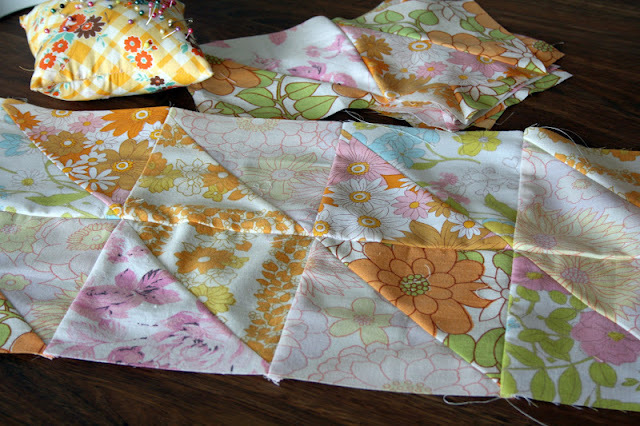 I have a tip I learned when I made my pinwheels quilt (about 17 years ago!). When you've cut out the squares, place one on top of another, right sides together, and draw a pencil line from one corner to another (this will be your cutting line later). Sew either side of the pencil line, then cut along the pencil line. The fabric holds its shape better than if you cut into triangles first. Does that make sense? Anyway, I don't know if you were doing that already, I just thought of it and thought I'd share! Charlotte was in that swap too so I'll let her know she should have a parcel waiting for her when she gets home. She'll be excited! She has had great success in NZ with linens tho! What a lovely collection of vintage sheets. They look fantastic as triangles. I got mine yesterday too,some really nice ones. I do my half square triangles like Yvette, it really is so much easier and neater (not to say yours aren't neat) I like the green, pink and orange together, nice for Autumn. I can see some of 'my' sheets in that quilt Lea...glad you're happy with the mix of patterns from the swap. I'm still waiting for mine...! oh yay! this is awesome :) it is always so fun seeing what people create from their returned FQs! i might need to get started on mine!